Nasal planum resection or planectomy is a drastic surgical procedure in the treatment of malignant disease of the nasal cartilage. It involves circumferential resection of the nasal cartilage rostral to the nasal and incisive bone of the maxilla. 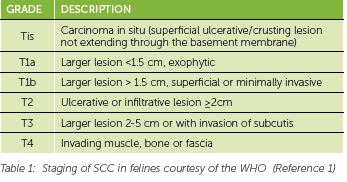 Even though this is considered drastic surgery mainly due to the appearance of the patient post operatively it gives the best chance of resolution in the case of highly invasive squamous cell carcinoma (SCC). Tip 1. Always discuss the postoperative appearance of the patient after the surgery with the client prior to the surgery. Often people don’t understand that the entire nasal cartilage will be removed and I find it best to show a picture of the post-operative appearance prior to surgery. Cryotherapy and radiation are the other most common modalities that can be used for treatment of invasive SCC. The reality is these do not provide gzood clean surgical margins, are generally multiple treatments over a period of time. They can delay the presentation of a patient for surgery but may adversely affect the long-term prognosis for survival. They can be given as alternative options to clients adverse to nasal planum resection. Tip 2. Surgery provides the best modality for a clinical cure. However it is considered invasive. Ideally surgery should not be delayed until the SCC has destroyed the entire nasal cartilage. Figure 1. Nasal SCC surgery – this patient had an extensive lesion requir­ing reconstruction of the philtrum as well. They need to be hospitalised for 3 – 4 days post op for wound care and pain control for an ideal response. The excised tissue is always sent for margin evaluation by a histopathologist. Photo Courtesey – Inanda Vets Tip 3. Thoracic radiographs are often unrewarding in detecting metastasis. Lymph node aspirates are generally more worthwhile to detect metastasis. Tip 4. This is generally a disease of older cats and serum biochemistry and haematology are usually a good idea in determining any concurrent illnesses. It can however be seen in young cats and this is still recommended. The patient is anaesthetised; the rostal maxilla is shaved and prepared for surgery. The patient is then placed in dorsal recumbency with a rigid foam block under the mandible to elevate the head. Patients should always be intubated. The junction between the cartilage and bone is determined. Tip 5. Masses in the T4 category generally will not respond to a simple planum resection and will require osteotomy of the maxilla. These patients are not candidates for planum resection. If there is any doubt a CT should be performed to determine bone involvement. Ideally 5mm margins should be taken between healthy and malignant tissue. A 15-scalpel blade should be used and a single cut performed to limit the haemorrhage. The cut is deep through the entire nasal cartilage and the underlying nasal turbinates to the incisive bone of the maxilla. All of this tissue needs to be removed. Once the tissue has been removed fine absorbable suture material is used to suture up the area. This can be performed in a simple interrupted fashion of a purse string like continuous fashion. Generally 5-0 polydioxone should be used. A small section of buccal mucosa and skin should be left ventral to the philtrum if possible. However if this it not possible due to invasion of the SCC this can be easily reconstructed. Tip 6. I will generally cut one half of the nasal planum then apply a few simple interrupted sutures between skin and nasal mucosa. This limits the haemorrhage and the nasal mucosa slipping into the nasal cavity. I will then remove the other half in similar fashion. A collar should be placed post surgery, this should be left on for 2 weeks till complete healing. I will generally continue IV fluids for 12 hours at maintenance. A single dose of antibiotics 30 minutes prior to surgery is all that is needed in these patients. Prolonged courses of antibiotics only lead to resistance and should not be given. Good pain control is essential to get these patients eating, buprenorphine is generally sufficient every 6 to 8 hours parentally. 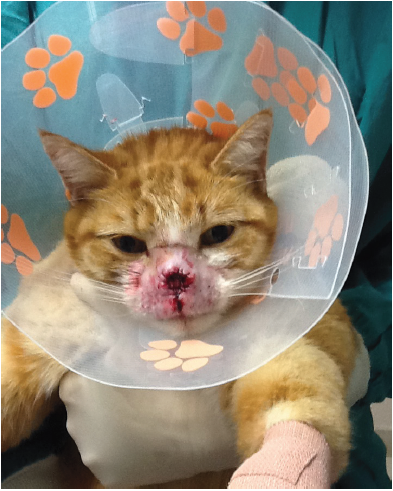 These patients need to be encouraged to eat, as smell is a large part of the feline appetite. Warmed tinned food is often a good option. Tip 7. I will generally send them home with oral Buprenorphine (injectable formulation dosed orally). This will be absorbed through the mucous membranes of the oral cavity. I will administer a single injection the day after surgery of a NSAID once the patient is fully hydrated post surgery. There may be a small amount of bleeding post surgery and there can be increased sneezing in some patients associated with bleeding. This will resolve with time. Tip 8. The removed section of nasal planum should ALWAYS be sent for histopathological examination even if you are 100% sure your margins are clear. With clear surgical margins the prognosis is fair to good. Average survival time is around 600 days in the reported cases.2 Generally recurrence is uncommon with surgical treated cases with clear margins. In cases where margins are not clear radiation therapy is recommended as an adjuvant therapy. However patients need environmental management to prevent further exposure to harmful UV radiation and formation of new SCC on non-pigmented areas. Tip 9. Application of animal sunblock’s should be applied daily on non-pigmented areas of these patients life long.